In a match made in hippie heaven, Phish guitarist Trey Anastasio will join the four living original members of The Grateful Dead for three 50th-anniversary shows July 3-5 at Soldier Field in Chicago. The Dead's last performance with Jerry Garcia, who died in August 1995, was at the same 55,000-seat capacity venue on July 9, 1995. The sense of closure is no ­accident: These shows are likely to be the finale for the "core four," as the ­surviving members are now known: Bob Weir, 67; Phil Lesh, 74; Mickey Hart, 71; and Bill Kreutzmann, 68. "These will be the last shows with the four of us together," Weir tells Billboard. Competition to land the coveted booking was stiff, with such players as Goldenvoice's Paul Tollett and Live Nation mounting efforts to reunite the Dead at venues like the Empire Polo Grounds in Indio, Calif., the site of Coachella, and Bonnaroo (the latter, according to sources, offered the band $3 million for a headlining set -- and was rejected). It helped that Shapiro has an exclusive contract with Lesh and co-owns three Brooklyn Bowl locations (Las Vegas and London opened in 2014) that are favorites of jam bands, as well as the Capitol Theatre in Port Chester, N.Y., where Anastasio previously had joined Weir onstage. 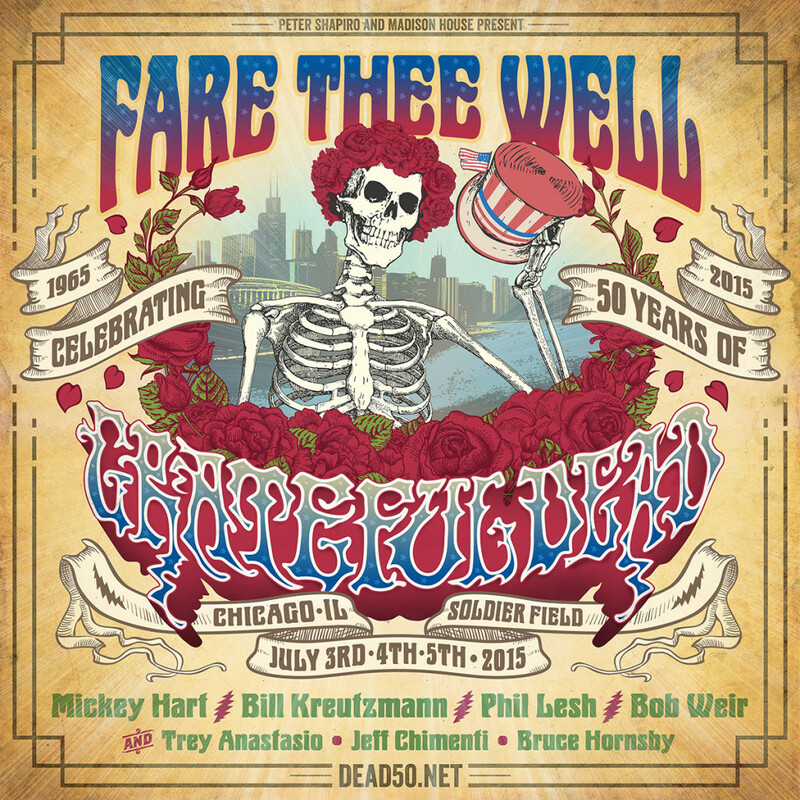 While many "Dead Heads" are now in their golden years, something tells us that the scene over 4th of July weekend is going to be epic and probably pretty "different". However, it's not like our neighborhood isn't familiar with this type of thing. After all, Lollapalooza brings a different atmosphere to the neighborhood, as does the upstart EDM festival Spring Awakening which is also at Soldier Field. Even Phish had a three night sold-out stint at Northerly Island last year. Net net, this is a big deal for many people and should be fun to see how big of a spectacle this ends up being. If you're not a Dead fan and want to get a sense of what the music is like click here for a youtube video from their last show before Jerry Garcia (lead singer and guitarist) passed away.